The Wearable Robotics Association Innovation Challenge 2018 brought once again single innovators, research labs, design teams and startup wearable companies from around the world in Phoenix in a friendly innovation challenge in front of the majority of the exoskeleton industry. 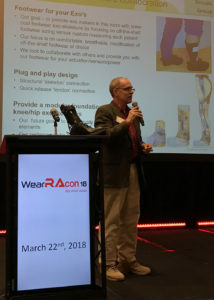 Entering into its third year, the WearRAcon18 Innovation Challenge delivered a more focused selection of whimsical to industrial applications of wearable technology. Amplius’ CEO and Founder Dylan Edmiston started off the innovation challenge with this: We need powerful muscles that are both flexible and powerful. Solution: Hydromuscles. Custom made seals that are soft on hard material. The market on actuators is large and growing. The only competition is traditional hydraulic actuators. Vision of the future: hyrdromuscles, passive undergarment suits that improve walking efficiency, and making a full body suit. Next step in the project is to move away from kevlar sleeves for the hydro muscles which will require additional finances. For more, visit Amplius’ Facebook Page. A non-Rigid Lower Extremity Sit-To-Stand (STS) Exoskeleton presented by Alexandros Mathioudakis and Krystyna Gielo-Perczak, UCONN School of Engineering. Problem statement: most exoskeletons encase the limbs and add motors. Another solution would be to mimic the human body without utilizing mechanically jointed structure. Their prototype is a knee controlled system that helps a person move from sit to stand. Notably, the dynamic analysis was initially completed with the AnyBody Technology’s simulation software. The goal is to shy away from motors applying motion directly at the joint but instead to use artificial tendons (be it metal wires or more elastic materials). Next step is to use an EMG system so the device can be used with a more intuitive control. The device size and weight also needs to be reduced. Interestingly, these types of non-conforming to the body exoskeletons that bulge away from the body are becoming very popular with exoskeleton enthusiasts and small wearable teams. This is in sharp contrast with the majority of the industry that is moving towards tighter devices that can ideally fit underneath clothing (more on that later). Why not use wearable robotics technology to create an animatronic tail for Furries!? There are approximately 2000 furries just in the Pittsburg area alone and thousands more around the world. Because these suits do not have facial expressions, body language is the main way to communicate. However, the tail is always rigid and heavy, but it would greatly help if it moved. Currently, there is already a product for moving the ears using voice-controlled commands. The goal is to create an intuitive EMG based control system for actuating the tail. You might think this is outlandish, but there are already multiple buyers and suit producers that have expressed interest to buy this device as an add-on kit for their suits. This is also a positive way to show wearable robotics being associated with big friendly furry animals. If commercialized, the MYOwTail is expected to sell around $250, which is well below the cost of a furry suit that normally ranges between $1000 to $5000. This elbow exosuit is made entirely from soft (compliant) materials reinforced by an outer cover, that has individual chambers that are filled and emptied. This wearable was based on OSHA recommended maximum lifting capacity. The individual inflatable actuators are arranged into an array that provides assistance during a lift. Most manufacturers already have a surplus of compressed air outlets at their facilities, and that is all that is needed to actuate the device. Goals for future research include the creation of a non-tethered model, protection of the intellectual property, and establishing key partners. The current prototype costs $111.04 which is less expensive than a rigid exoskeleton counterpart. Upper body wearable robotics for children look like fun in Marvel movies, but no kid wants to go to school with a large bulky wearable. Furthermore, kids want to be able to play, run, and tumble. Large exoskeletons get in the way. We are not looking for superpowers, but to help kids perform basic tasks like being able to raise their hand far enough to be able to feed themselves. Each x-scissors device is configured custom to each shoulder. Being compact is the key, improving wearability and accessibility. This device can provide support if energized, and immediate structural support and injury prevention even if left unpowered. This project also utilized Anybody Technology’s modeling software. The X-scissors is a shoulder-elbow exoskeleton that comfortably fits under a regular jacket while retaining its rigid frame. Achieving true wearability will require compactness. Essentially, the X-scissors combines the best of exoskeletons and exosuits! The team hopes to commercialize within 6 months. That is quite possible, the previous winner, EduExo did go to market within a few months of taking first place at WearRAcon17. Trexo – there is no reason to build a new body weight support system for pediatric exoskeletons. Use the already existing walkers that are made and designed for children and add the exoskeleton to the already existing structure. Another cost reduction is based on that children are lighter and require a smaller, less powerful exoskeleton. Current possibilities for children rehabilitation are limited and expensive, for example, there are only two Lokomats in the pediatric configuration in all of Canada. The goal is to transform the existing walker into a fully powered device. The Trexo Plus is already Health Canada certified. Up next are pilot studies. This is an example of a truly collaborative project, with engineers and advisors from multiple wearable robotics specialists (Shirley Ryan Ability Lab, NASA, Bionik Laboratories, Holland Bloorview) contributing to the initial success. Imagine a wearable device that engages on-off on demand with a tap. Now add that it can be worn entirely under your clothes and you get the Mechanized Clothing. This means that it won’t snag in a warehouse and it can be protected under work clothing such as hospital scrubs or a lab coat. The Mechanized Clothing is a quasi-passive device that uses a clutch system to engage and disengage elastic elements in the lower back. Initial research indicates that it can reduce fatigue and muscle activation forces during lifting. In addition to an IEEE application, a full patent application has been filed and the company has been incorporated. The next step is to apply for more funding. In 2016, Mark Roser came to the WearRAcon16 conference looking for a collaboration and found just that with David Armstrong. Diabetic foot ulcers don’t heal, and re-ulceration has to be prevented. The goal is to have a passive exoskeleton that offloads the force on the forefoot. After an adoption period, patients can walk at the same speed with the Flyband. Furthermore, the interface improves perception in the foot sole, which is typically limited in people suffering from foot ulcers. Mark Roser is looking for new collaborations to integrate already existing exoskeletons with the Flyband, which can also transfer loads around a regular shoe or boot directly into the ground. 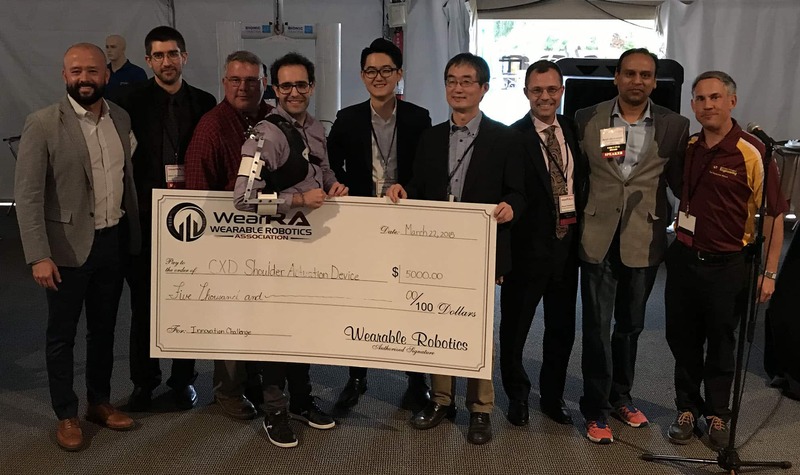 And the WearRAcon18 Innovation Challenge winner is!? This year’s WearRAcon18 Innovation Challenge contenders were more focused than ever in creating wearable technology that serves a purpose and meets a need. Wearable robotics projects ranged from the serious labor assist exos to whimsical inventions for play. Two clear themes crystalized during the event: software modeling of wearable mechanisms to predict how they will behave before being built, and the reduction of the footprint of exoskeletons and exosuits to the point where they can fit under jackets or work clothes (or directly on top of existing footwear). With the above-outlined trends in mind, it was no surprise that the team that utilized both software modeling and had an exoskeleton that most closely followed the contours of the most complicated joint in the human body won the day! Congratulations to the team from Aalborg University on winning the WearRAcon18 Innovation Challenge with their Compact X-scissors Device! Special thanks to StrongArm Technologies for sponsoring this event for the second year in a row! Please register me for your newsletter.